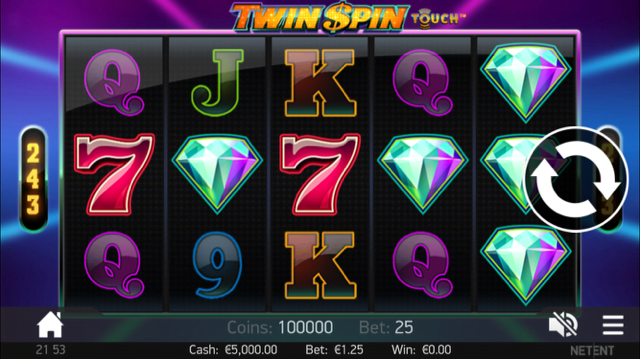 Twin Spin slot machine from NetEnt takes the classic symbols from a fruit machine such as a 7 or a Bell and gives it a modern twist, and is one of the best mobile slot games out there in our opinion because of its 243 paylines and simple game play. There are no bonus rounds or free spins to speak of but because of the number of lines the wins come thick and fast and its never a boring experience. Keep reading below for all the details in the full Twin Spin slot review. While many software developers still seem to love them, it’s certainly getting harder and harder to find a place for classic slot machines in the ever-evolving mobile gaming industry. Thankfully NetEnt slots have countered that problem with the Twin Spin slot, a retro-designed game given a very modern facelift. Although the game looks like a conventional bricks and mortar slot machine with cherries, liberty bells and BAR symbols adorning its five reels, the addition of the feature that gives Twin Spin its name and the inclusion of 243 active paylines really gives the game a much more cutting-edge feel. While we’ll go into the Twin Spin feature in a bit more detail later, players will also be delighted to discover that both the game’s payline animations and the sound – which includes a pretty funky piece of background jazz – have been tweaked to make sure it keeps pace with modern video slots. Although the Twin Spin slot machine doesn’t boast any bonus rounds per se, the whole concept the game is based on is a unique feature in its own right. At the start of each spin, a player will automatically receive two random “twin” reels, which display identical symbols and can feature anywhere on the gameboard. These dual blocks of symbols make it far easier for mobile casinos players to complete winning paylines, and the best news is that they don’t just stop at twins – if you’re lucky, you might get triple, quadruple or even quintuple matching reels, the latter of which will obviously give you five five-of-a-kind combinations by default. Although this reel expansion feature comes around very rarely, it doesn’t take a genius to figure out that when it does it can bag you some big wins – especially if you’re lucky enough to land the 1,000x regular jackpot for five matching diamonds on one or more of your winning paylines. Failing this, the game also features a wild symbol which, when combined with the twin reels, usually awards a prize. Given how unbelievably dull the vast majority of classic slots are, we really like what NetEnt have done with the Twin Spin slot. Though the lack of bonus rounds will obviously drive many players to look elsewhere, if you want a retro gaming experience with a modern twist, this is the slot for you. Like the Twin Spin slot review? Check out these as well…..